I cannot believe it’s already Wednesday. I feel as if I am still coming down from the clouds. I spent the weekend with my parents and my mother and I were completely connected at the hip. We celebrated Cinco de Mayo at their neighborhood Mexican restaurant and I cannot even tell you how many lime and club soda’s I had. I felt as if I was throwing back a good time, especially after the fajitas! I love life. If I haven’t expressed it enough, club soda in cocktail glasses are my saving grace. Most people do not like to drink alone. Often times when I meet someone for dinner, it’s usually just two people catching up. I have found that when I order a non-alcoholic beverage, I get questions such as, “are you not drinking?”. When I say, “no”, the other person is totally disappointed because they wanted a drink but drinking alone is not acceptable. In the past, I felt the guilt and caved under pressure. Since ordering my drinks in cocktail glasses with garnishes, everyone is happy! Which is hilarious since… they’re still technically drinking alone. Whatever helps the mind, I say! 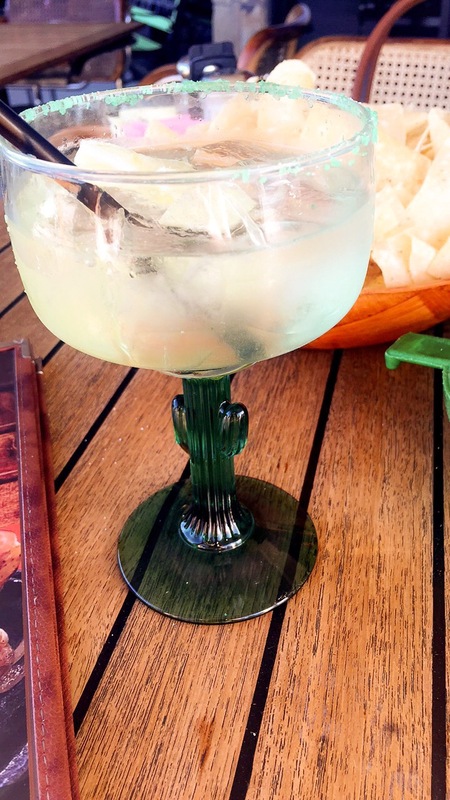 Speaking of drinks, did you happen to party with one of these faux margaritas over the weekend? If you did, which one did you enjoy!? I enjoyed countless strawberry “mojitos” out by the poolside all weekend long. So, bruschetta. Does it get any easier than an appetizer ready in less than 10 minutes? It’s fresh, it’s delicious, and it’s the easiest dish to make in a time crunch. The time it takes to make this dish is solely dependent on your chopping game, which I know is strong. 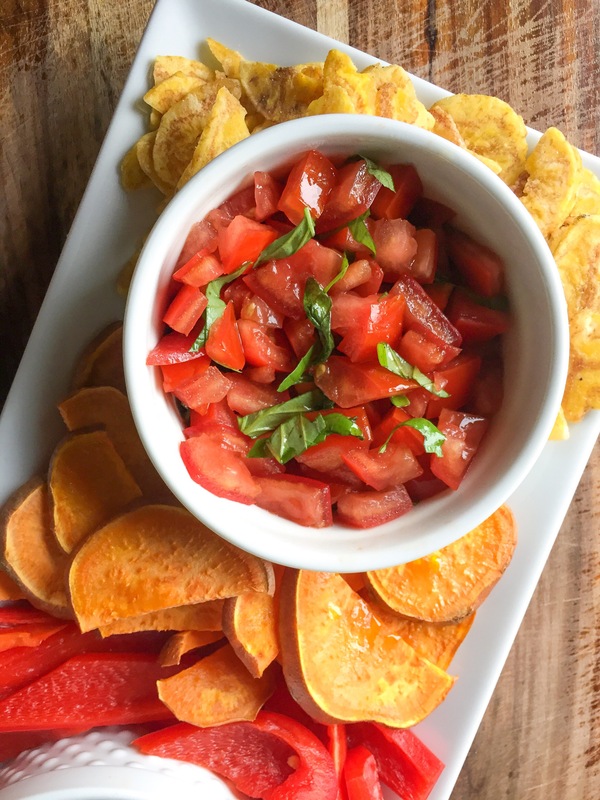 Traditionally, bruschetta is served on toasted bread rubbed with a garlic clove but I have found that sweet potatoes and plantain chips work just fine too. Of course, you can offer the traditional servings for your guest. I hope you find this bruschetta as easy and delicious as I do. If you’re looking to make more than one appetizer, my absolute favorite pair with bruschetta is spinach artichoke dip. I will be sharing a dairy free version this upcoming Saturday morning. As always, if you decide to give this recipe a “go”, comment below or email me to share your thoughts! Servings: 10-12 “toasts”, if serving prepared. 4 Basil leaves, cut into thin strips. Wash and cut the sweet potatoes in half, width ways. Cut each side in half once more and slice into 1/4 inch disks”. The slices should resemble half moons. Lay flat on a parchment lined baking sheet and bake for 15 minutes or until crisp. As a dip in which people can build their own. Combine the tomatoes, basil, vinegar, and oil in a serving bowl and stir to incorporate. Already assembled on a serving platter. In a small mixing bowl, combine the tomatoes, basil, vinegar, and oil and stir to incorporate. Without Goat Cheese: Lay the toasted sweet potatoes out and top with tomato mixture. With Goat Cheese: Spread goat cheese over each sweet potato “toast” and top with tomato mixture.